In large bowl, beat cake mix, buttermilk, oil and eggs with electric mixer on low speed 30 seconds, then on medium speed 2 minutes. Stir in crushed cookies. Divide batter evenly among muffin cups. Bake 15 minutes or until toothpick inserted in center comes out clean. Cool 10 minutes; remove from pans to cooling racks. Cool completely. Stir food color into frosting; frost cupcakes. 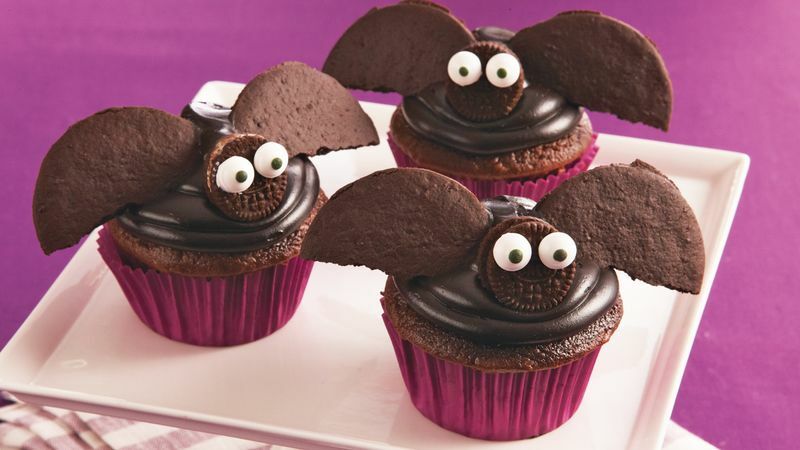 Insert 1 chocolate wafer cookie piece on each side of cupcake to look like bat wings. Place 1 miniature sandwich cookie between cookie pieces for bat body. Squeeze 2 small dots white icing onto each cookie; attach candy eyes.